The PEARS procedure is now available at the Royal Brompton Hospital in London and several other centres in the UK and Europe. Prospective patients can be referred by their consultant or general practitioner directly to the appropriate surgical lead. See a list of surgical centres and surgical leads. Patients may be regarded as suitable for this procedure if they have Marfan syndrome or a related condition. They must also have a dilated aorta (i.e. an aorta which is larger than the “normal” 3.2 to 3.6 cm as measured atop the aortic valve cusps) and be asymptomatic with a functional aortic valve. In preparation for this procedure, the patient receives a CT scan to produce the images and data from which a 3-dimensional model of the aorta can be made. 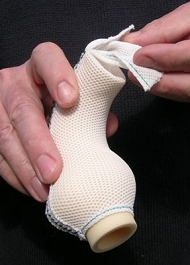 From this model, the technique of 3-D printing is used to create a plastic former that exactly matches the patient’s individual aorta. This former is used to provide the shape to a soft and pliable textile used in the manufacture of the ExoVasc® PEARS implant. The procedure to fit the ExoVasc® support involves open chest surgery and takes about two hours. Cardiopulmonary bypass using a heart lung machine is not usually necessary, the procedure is carried out on the beating heart and the aorta and aortic valve remain intact. The ExoVasc® support is removed from its former and is placed around the aorta and sutured into place without interrupting the circulation or cutting into the aorta.